This is a display unit. It helps you to view the content of the System Unit. Monitor look like a television screen. Both a television and a monitor contain a Cathode Ray Tube, and work in a similar way. The image or picture quality is measured in term of the resolution of the screen. The computer communicates to the user through the monitor. It also displays instructions sent to the computer by the user as well as results/information sent from the computer back to the user. When shopping for a new computer system, we tend to worry over such things as the CPU speed or hard disk size, but what about the one device of your system that is used just as much? Of course we're talking about the monitor. Often referred to as a display screen, a video display terminal (VDT) or visual display unit (VDU), the monitor is the device of your computer system that displays the messages and data being processed and utilized by the computer's CPU. The two types of monitor technologies available to consumers are available in CRT monitors and LCD monitors. There are big differences between LCD and CRT, and while LCD technology has advanced to the point where its viewing quality is comparable to CRTs, many people today still choose to purchase a CRT monitor. CRTs are bigger and bulkier than an LCD, they consume more power and are prone to screen flicker. 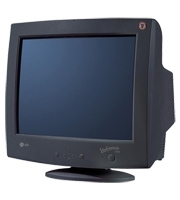 LCD monitors, however, are more expensive when compared to CRTs, they introduce the problem of viewing angles, and generally have less accurate color replication. Each type of monitor, as you can see, has its advantages and disadvantage. In this article we will provide a comparison of CRT and LCD monitors, along with defining some of the many specifications and terminology you should be aware as you decide between an LCD and CRT monitor. Short for cathode-ray tubes, CRT monitors were the only choice consumers had for monitor technology for many years. Cathode ray tube (CRT) technology has been in use for more than 100 years, and is found in most televisions and computer monitors. A CRT works by moving an electron beam back and forth across the back of the screen. Each time the beam makes a pass across the screen, it lights up phosphor dots on the inside of the glass tube, thereby illuminating the active portions of the screen. By drawing many such lines from the top to the bottom of the screen, it creates an entire screen of images. Short for liquid crystal display, LCD technology can be found in digital watches and computer monitors. LCD displays use two sheets of polarizing material with a liquid crystal solution between them. An electric current passed through the liquid causes the crystals to align so that light cannot pass through them. Each crystal, therefore, is like a shutter, either allowing light to pass through or blocking the light. Color LCD displays use two basic techniques for producing color: Passive matrix is the less expensive of the two technologies. The other technology, called thin film transistor (TFT) or active-matrix, produces color images that are as sharp as traditional CRT displays, but the technology is expensive. There are many aspects that differentiate the two technologies. Obviously, LCD monitors are much slimmer and cosmetically appealing than CRT monitors are. 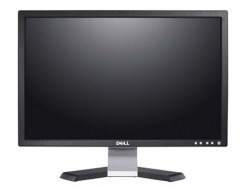 LCD monitors usually weigh 6-12lbs whereas as CRT monitors can weigh upwards of 15lbs. When it comes to angle of view CRT monitors are better, however the viewing angle of LCD monitors is steadily increasing and current models offer viewing angles over 160 degrees—for most practical purposes that is sufficient. CRT monitors have better color purity; however, the best LCD monitors are comparable. LCD monitors can have dead pixels, which are little dots on the screen that are stuck as one color. CRT monitors do not have this problem. LCD monitors require far less energy to operate. Their consumption is in the region of 25 -50 watts compared to CRT which consume like 60-80 watts for a 15 inch model to almost 70 to 150 for 17 and 19 inch models. Also, LCD monitors are far brighter than CRT monitor. In fact, LCD monitors are twice as bright as CRT monitors. CRT monitors can be messed up when they are near a magnet; this is not an issue with LCD monitors. Lastly, screen flicker is not apparent in LCD monitors, whereas it is a big problem with CRT monitors. In conclusion, I think it depends on your needs, to determine which type of monitor you need. LCD monitors are good for the office, home, and entertainment. But, I CRT monitors are good for graphic designers and fighter jets (because they can still operate, even when they are being shaken violently).